Somewhere behind the frustrating timers and social friend-bothering quests of FarmVille 2 there's a lovely little farming and crafting simulator. Zynga brings out the best in the game with FarmVille 2: Country Escape for iOS and Android. Rather than porting FarmVille 2 over to mobile, bringing all of its baggage along, Zynga built FarmVille 2: Country Escape from the ground-up with the mobile gamer in mind. It's part of the company's "mobile first" initiative, along with Zynga Poker, acknowledging that what works on Facebook isn't necessarily going to work on a smart phone or tablet. Country Escape does not feature quests involving having to ask everyone on your friends list for pieces of wood. There is no waiting for a well to fill to be able to water your crops. There are timers, but implemented in such a way that there's always something to do while you wait. Did I mention you can play the game offline? Tend your farm, feed your animals, craft some socks — just hop online later at some point to save your progress. Lovely. The basic FarmVille idea is still there — farm fruits and vegetables, use them to cook items for quests or sell them in the market for coin to purchase more land. It's just a bit more strategic, adding elements of resource management to the mix. You've got a limited amount of storage on the small coastal farm, so you're constantly juggling supply and demand, a circus act that becomes more difficult as you level up and unlock new features. It gets me right in the obsessive compulsive. Take a look at my farm while I compose myself. Mind the kitchen noises in the background. Apparently I have a kitchen. See? All the good bits, with some extra good bits thrown in for good measure. Farm hands who can be set to harvest special areas of the farm for rare items. Timed production quests with big rewards. Endless freaking water, and the ability to send some of it (and other items) to your dry and dusty Facebook farm. There are still social features, should you choose to accept them. There's a marketplace where players can sell their produce and items to each other. You can visit your friends' farms, if you decide to have friends. You can even join a co-op — basically a FarmVille 2 guild, complete with in-game chat. Or you can just play alone, Mr. or Mrs. Lonely Loner Who is All Alone. That's cool. 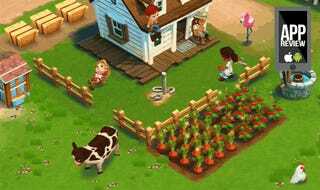 Zynga's goal with FarmVille 2: Country Escape was to build a better FarmVille game for mobile devices. They may have built the best FarmVille game of series.